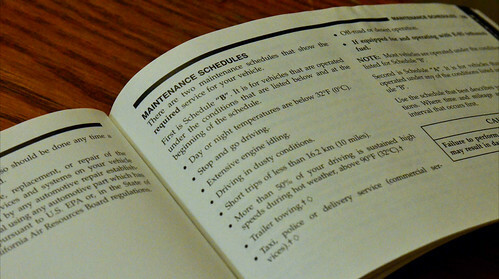 Of all the useful specific pieces of information in your car’s manual, the manufacturer’s maintenance schedule is perhaps the most useful. It tells you exactly how often normal maintenance should be performed on your car based on the odometer, and it’s that maintenance that will keep your car on the road without worry for a long time. I can speak from experience on this topic. The very first car I owned was a 1985 Buick Skyhawk. It was a rusty old beast that a friend of my parents had basically abandoned. He had driven it practically to death and it needed several repairs to become road worthy, so I invested some significant time and quite a bit of savings into that car. I loved that car and the sense of freedom that it represented, but I didn’t have a clue about how to keep it running. Once I had the thing working, I pretty much drove it into the ground. When it stopped running once, I took it to a garage where a guy showed me that my fluids were basically sludge. That got me to regularly replace my oil and transmission fluids, but most of the rest of the maintenance was lost on me. In college, my wife-to-be Sarah was driving a van when a master timing belt blew out. It turned out that the belt was about 25,000 miles past time for replacement according to the maintenance schedule. This resulted in us spending a night in a very tiny town in the middle of nowhere. Rather than looking at the schedule, though, I just kept adding things like this to the “checklist” in my head. Whenever I would go to a repair place, they’d just tell me something else to worry about and I’d try to remember it – and usually fail. It wasn’t until 2006 or so when I really began to recognize that the maintenance schedule in the glove compartment was really useful. It’s just so simple to schedule an appointment every two or three months, get the next line in that schedule filled in (usually, it’s every 5,000 miles on newer cars), and be on your merry way. It’s also far cheaper, less stressful, and easier on your time management, too. It’s just better to drop maybe $20 or $30 every few months and maybe an extra $100 to $200 a year on maintenance on your vehicle than to watch something blow out a year and a half later, causing you to lose hundreds out of pocket on repairs and likely find yourself in a real pinch in terms of getting to work or getting to other life responsiblities. With our two newest vehicles, we’ve followed that maintenance schedule in our manual to the letter. Every item has been handled right on time, within a few hundred miles on either side. Guess what? We’ve had no significant breakdowns of any kind in years. No emergencies, no unexpected smoke from under the hood, no thousand dollar towing and repair bills. It’s just been regular maintenance and cheap, worry-free driving.